Many garment workers earn less than 25% of the wage needed to support a family's basic needs even when working full time. To obtain a fair living wage they need to negotiate a 400% wage increase. Do you accept that attempts to negotiate such a high increase are likely to be rejected, particularly in countries where strikes are met with police intimidation and brutality? 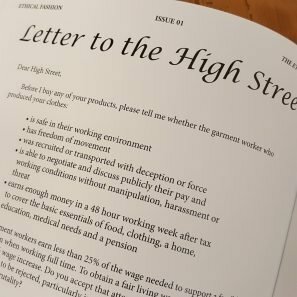 If the current pay rate of your garment workers requires more than a 20% pay increase to achieve the minimum living wage, are you shareholders willing to invest in subsidising the difference, adopting a revised business strategy if necessary to top up garment worker wages and collaborating with other brands and suppliers to eradicate wage slavery? 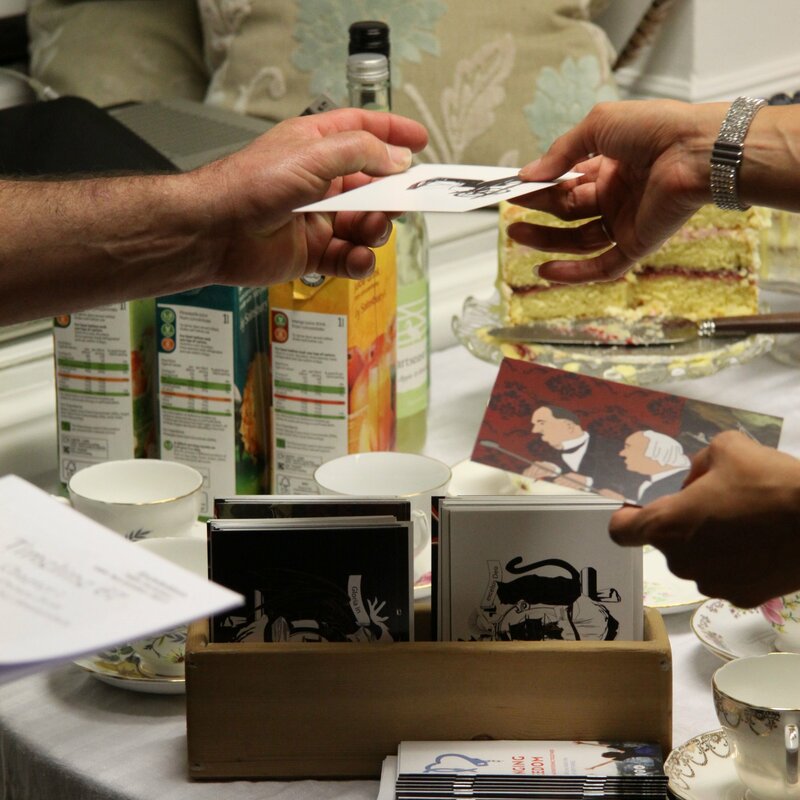 The very first story to be presented in this way is Timeline 67, a story set in 1901 and inspired by a shipwreck in Cornwall. Each t-shirt also has a sub-text story that is inspired by the giant issues we are currently facing in our society – trafficking, homelessness and the refugee crisis. The t-shirts are being released as a limited edition of only 100 t-shirts. We operate a zero waste policy so the t-shirts are only printed when we know we have a buyer who wants and values them. This means that every t-shirt you order is specifically printed just for you. We only make one order at the end of every month. Pre-orders open at the beginning of each month and close on the last day of each month. 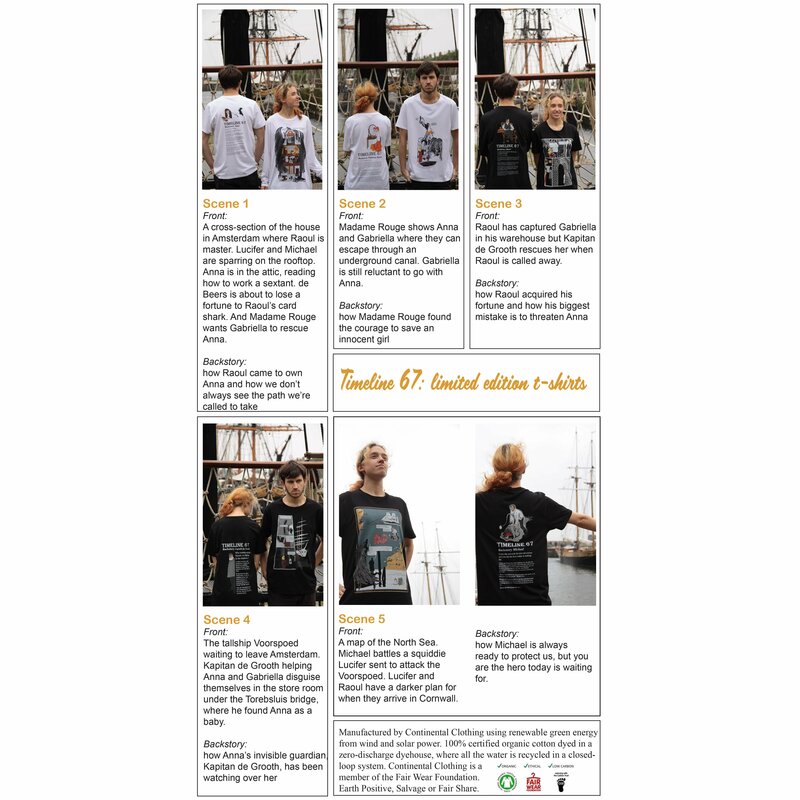 Printed on the highest quality textile digital printer in the UK, the t-shirts are then signed and numbered by hand by author/illustrator Tracey Dockree and registered on a secure database so that you know you have the original t-shirt and not a copy. 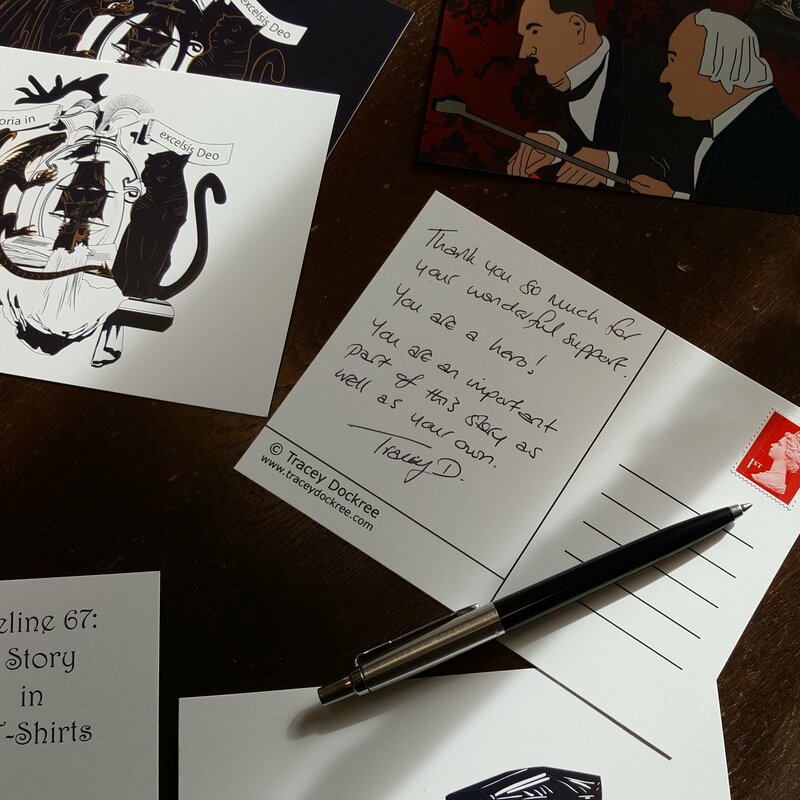 Printing usually takes a fortnight so, allowing for delivery times and hand-signing limited edition items, your order should reach you by the end of the following month. For example, pre-orders made in April should arrive by the end of May. 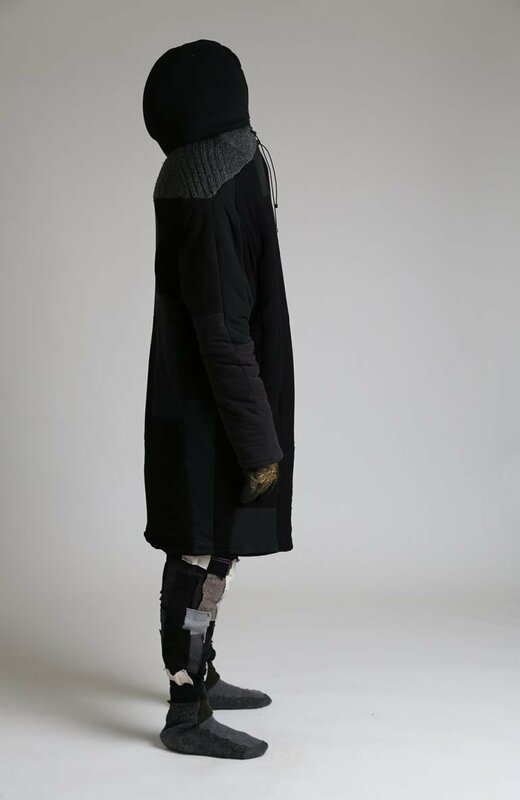 The notice at the bottom of the page will let you know the expected delivery date for pre-orders that day. 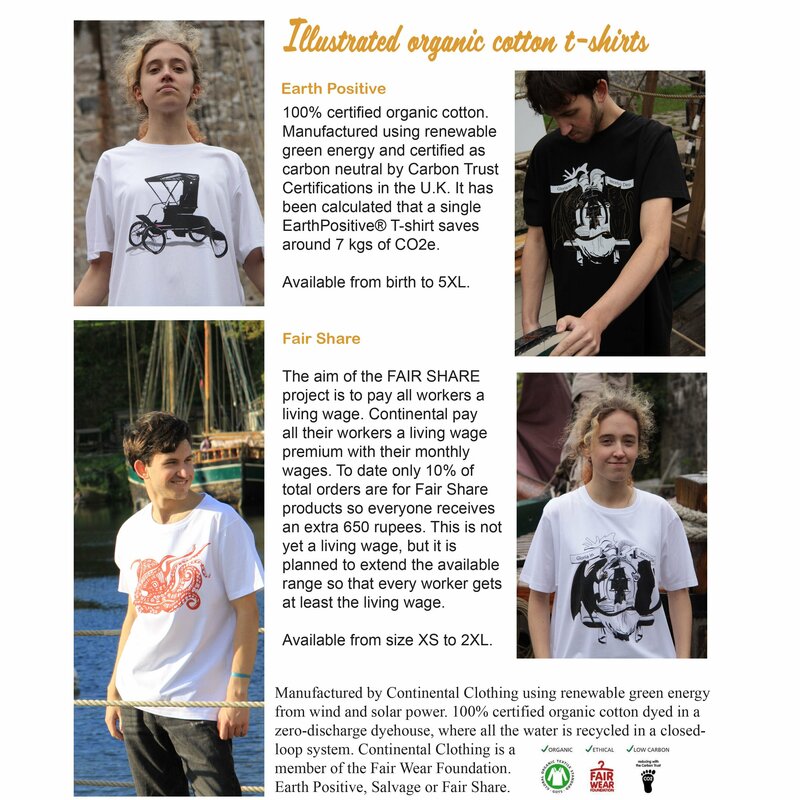 We print on Earth Positive t-shirts made by Continental from organic cotton with a neutral carbon footprint and manufactured using renewable energy. Continental is a member of Fair Wear and operates a Fair Share policy to ensure their garment workers receive a fair wage. 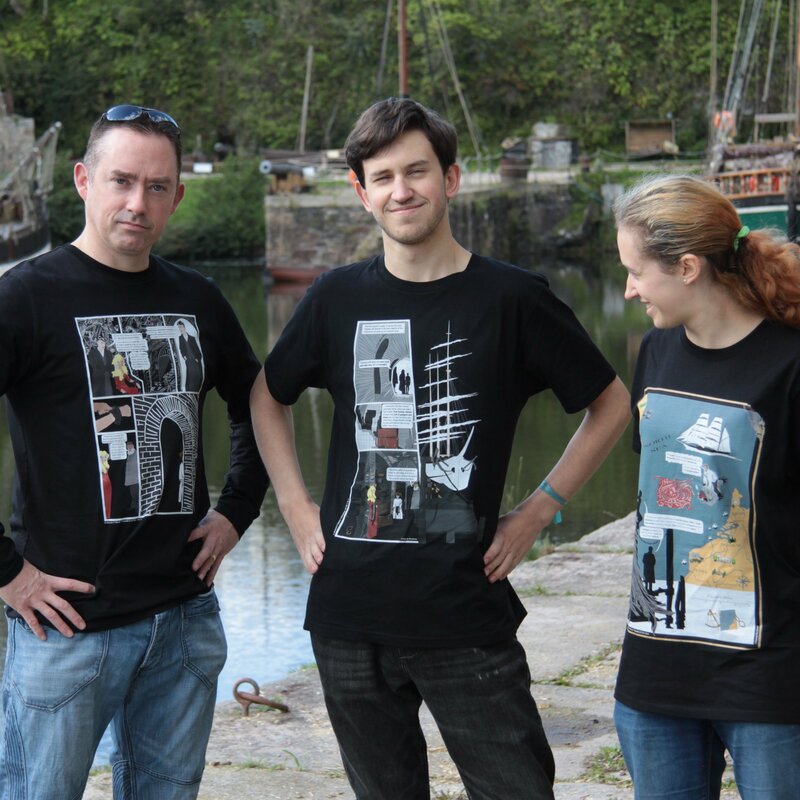 Each t-shirt has an illustrated scene from Timeline 67 on the front and the backstory of a character on the back. These t-shirts are limited to 100 of each scene and will be signed and numbered with your name and number kept on a secure database to prevent it being copied. The t-shirts are organic cotton, ethically manufactured and carbon neutral. Designed for story lovers and art lovers, these high quality organic cotton book bags are ideal for stashing those books you want to read at the beach, the park or at book festivals. 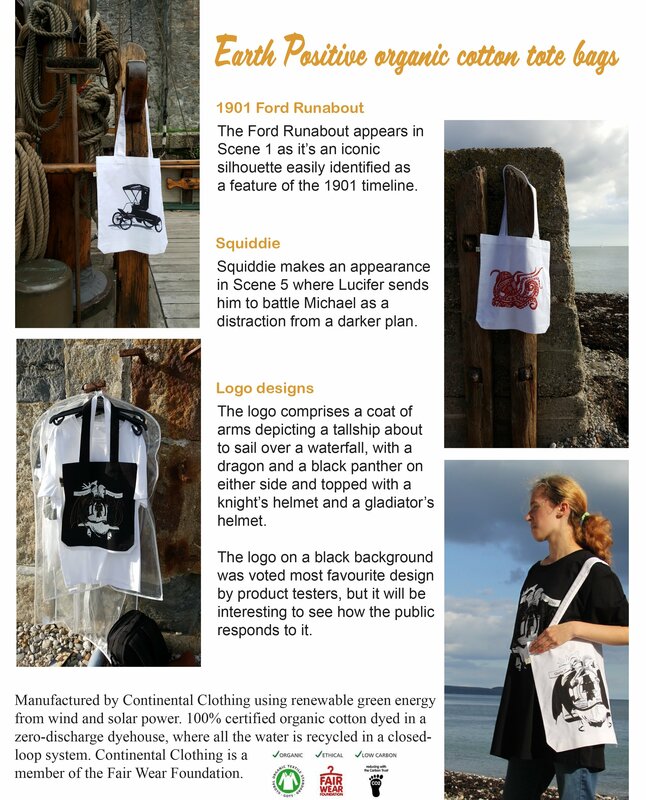 Made using renewable energy sources and printed to order, just for you, to minimise waste. These bags should last a while, but if there's any mishap and your bag gets damaged, send it back to us and we'll repair it for you. There's great excitement here as we get ready for the Timeline 67 exhibition. I've just picked the Gallery Prints up from our local eco printers, Monkey Puzzle Art Prints, who are based at Mount Pleasant Eco Park near Porthtowan in Cornwall. A joy to travel to as I have to go past gorgeous views of the North coast beach at Porthtowan, and usually have to stop at the headland to enjoy the view and fresh sea air. I used Adobe Illustrator to create these 5 scenes from Timeline 67 Chapter 1. I'm delighted at how well all the small details look when they're blown up into A1 sized prints. I'm only selling 100 prints of each design because I want our lovely fans to have the privilege of owning artwork that's an investment piece rather than mass-produced and commercial. They are printed using a special process called Giclée, a fine art digital printing process where the highest quality pigment based inks are sprayed onto a high quality archival paper to produce a print that lasts over 75 years. 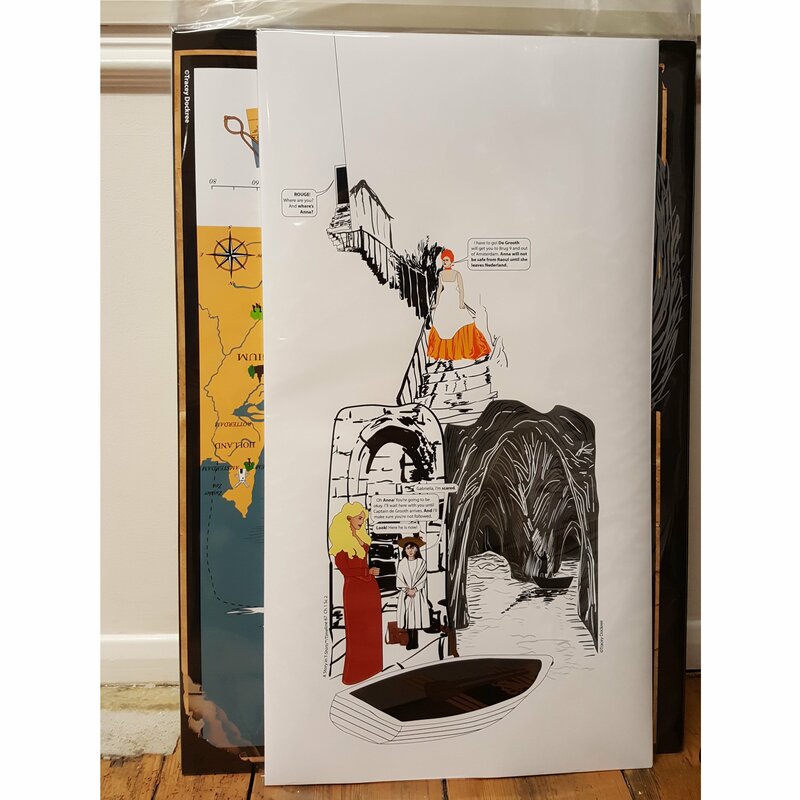 Each print is printed to order to minimise waste, so as soon as you place your order it gets sent to the team at Monkey Puzzle Art Prints, who will usually print it within the next 4 working days. All prints are signed and numbered by hand by the illustrator, Tracey Dockree, and entered onto our secure database so that we can identify whether any prints are originals or fakes. Gallery Prints are A1 in size: 594 x 841 mm / 23.4" x 33.1"
For more information about each Print and to choose your preferred size, select it below. These beautiful postcards are illustrated by Tracey Dockree and printed locally in Cornwall on recycled card.